Traffic congestion in Leicester is still increasing so if you are travelling by car, you may need to allow extra time for your journey as queuing for the car parks can occur at peak times. The latest information about roadworks and traffic within Leicester is provided by Leicester City Council on the Traffic Information website. The Enderby Park and Ride now stops outside Leicester Royal Infirmary. To recuce congestion, we ask that you please consider using Park and Ride rather than driving into the city. Alternative parking is available for patients, visitors and prime carers at NCP Welford Road. Collect your ticket at the NCP machine and bring to the Car Park Office at Leicester Royal Infirmary for validation. Validated tickets will be charged at a reduced rate. Access to the car park is via the existing entry on Havelock Street, and is ‘pay on foot’. There are pay machines in the car park and users will be able to pay with cash and debit cards. Charges are as below. The location of the multi-storey car park is marked on the site mark above. Please be aware there is a charge to park in our hospital car parks. 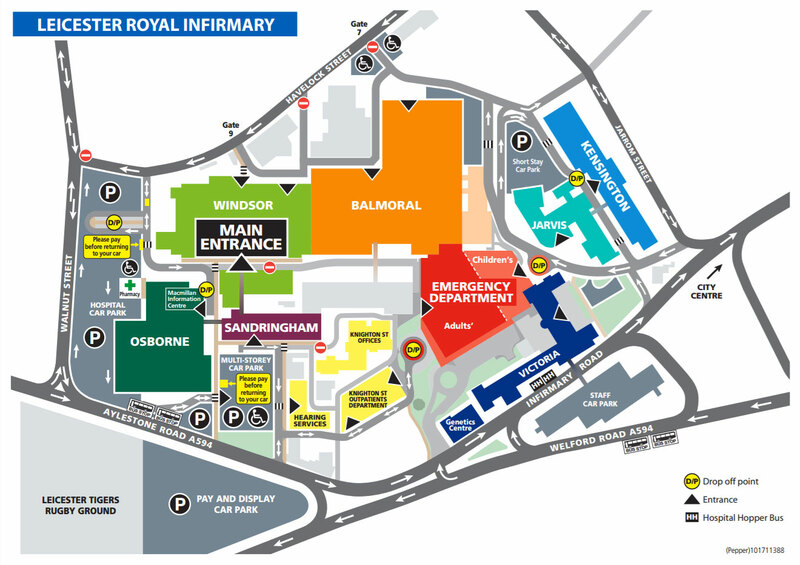 The car parks at the Leicester Royal Infirmary operate via a pay on foot/pay on exit method. This means you park up, visit the hospital and on leaving you locate a pay station, insert your card and pay for the time you have been in the car park. Leicester Royal Infirmary car park, which includes the multistorey spaces, is accessible via Havelock Street and is open 24 hours a day. The car park is open 24 hours a day, 7 days a week. Please contact the Customer Service Centre on 0116 204 7888 for further assistance. If you are displaying a blue disabled badge you can park for free in the marked disabled spaces outside the main public car parks. However, if you park in the main public car parks the parking fee will still apply. There are drop-off points at the main entrances to all of the hospitals. Be careful when parking to keep restricted areas clear. These are indicated by red markings. Cars parked in these areas will be dealt with accordingly. The prime carer of a patient that has been in hospital for more than 6 weeks will be provided with free parking from the beginning of the seventh week. There will be one exemption per patient but this can be passed between carers. The prime carer must provide proof of previous car park usage. The car park office can be found on the ground floor of the Windsor building, it is signposted as ‘Car Park Office’. When entering the Windsor building from the main Havelock Street car park you need to walk past the reception on your left and head towards the end of the corridor. At the end of the corridor turn left and walk towards the orange walls about half way down the corridor. Before you get to the orange walls you will find the corridor widens, and the car park office is on your left here. You need to turn left and immediately left (back on yourself), press the buzzer on the wall (right hand side) and stand back as the doors open outwards.